Part wordsmith, part bully, all ego, Keith Olbermann’s Olbermann has barged into view this week on ESPN2’s 10 p.m. alternative to the mothership’s SportsCenter. The one-hour show comes complete with two helpings of “Keith Lights” (“What you need to see, what I need to describe”); “This Week in Keith History” (nightly video of our hero in a funny mustache during his earlier tour at ESPN); and the host’s propensity to vilify and ridicule others without ever engaging in a one-on-one sparring match. One can acknowledge Olbermann’s talent -- and he does have it -- while also wondering why this big brainiac never seems to have anyone on his show who disagrees with him. That includes those he savages on an almost nightly basis, whether it lately be New York Daily News Jets beat writer Manish Mehta (on Monday’s opening segment) or CNN prime-time host Piers Morgan (a “Worst Person in the Sports World” on Wednesday’s show). During one of his many previous incarnations, as the host of Countdown on MSNBC, Olbermann delighted in deriding Fox News Channel’s Bill O’Reilly as “Billo the Clown.” Whatever one thinks of O’Reilly, he does make it a point to interview those with opinions he doesn’t share. Others are invited -- or goaded -- to show up on The Factor after O’Reilly assails them. Few take the bait but at least the effort is made. Olbermann simply preaches, decrying the state of journalism while also violating its basic tenets. Perhaps Mehta was guilty of an impulsive tweet, as are most of us from time to time. But why not ask him if he’d like to defend himself rather than making the guy a veritable Public Enemy No. 1? And if Mehta declined, then say so on the air. 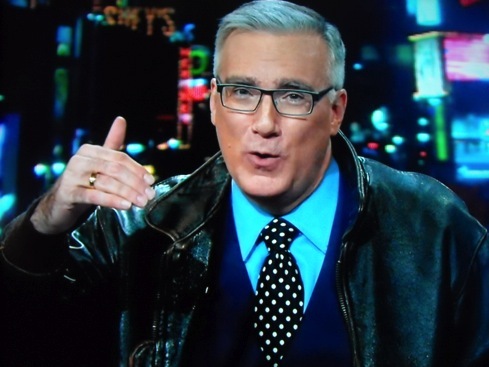 That’s not Olbermann’s style, though. Instead he invited another controversial and now reinstated ESPN commentator to agree with him during the show’s inaugural studio interview. Jason Whitlock, who has gotten into trouble for his own impulsive, racially tinged tweet about NBA guard Jeremy Lin, proceeded to lecture from on high about the parasitic state of journalism while Olbermann lapped it up. “We’re all just fodder to be eaten and used to prop up someone else’s relevancy,” said Whitlock before suddenly switching to Lamar Odom and his alleged drug addiction. “No one’s looking at Lamar Odom as a human being,” Whitlock lamented. Olbermann ended their segment by telling one and all that “every reporter should spend one day as the only story in the world.” That way they’d supposedly reap what they sow. The man was “picking his lineup,” said Olbermann. In fact the guy very much seemed to be scratching the tip of his nose and then rubbing the side of it -- not picking it. But Olbermann had his designated, defenseless buffoon, so what’s it to him? He later lampooned a chubby Kansas City Royals cameraman who could be seen dancing after his team hit a home run. “OK, I needed to see that,” Olbermann said with affected disdain. Bayless and cohort Stephen A. Smith very animatedly preside over ESPN2’s daily First Take show. Both are blowhards. But at least Bayless had the stones to square off against Cuban in one of First Take’s more memorable face-offs. In contrast, Olbermann has long been a hit-and-run driver -- and an oftentimes surprisingly lazy interviewer as well. In that respect, he never asked Cuban about Odom, whom the Mavericks endured before finally cutting him loose. Some reports have alleged he was heavily into drugs while with the Mavericks. If you’re Olbermann and you have Cuban sitting right next to you, don’t you at least ask the question? Here’s another example of how Olbermann operates. In Monday’s first “Keith LIghts,” the New York Yankees’ embattled Alex Rodriguez was shown hitting a meaningful home run early in his team’s game against the Toronto Blue Jays. Olbermann pretty much played that highlight straight. Not so on Tuesday night’s show, when A-Rod hit a home run after the Yankees already had the game in hand. Olbermann opened both the Tuesday and Wednesday Olbermanns by blasting the hypocrisy of college sports and the NCAA’s handling of Texas A&M quarterback Johnny Manziel. No real problem with that. But it also would have been an optimum time to debate a guest who disagreed with Olbermann on whether college athletes should be paid for their services. Instead, Olbermann had kindred spirit Tony Kornheiser as a guest and then, via satellite, Seattle Seahawks quarterback Russell Wilson. On Wednesday, tennis analyst John McEnroe and Denver Broncos quarterback Peyton Manning (also by satellite) were the guests. Manning, who with his brother, Eli, is a paid spokesman for DIRECTV, was allowed to do the entire interview with that company’s logo displayed prominently behind him. And at the end of their amiable chat, Olbermann dutifully asked a question tied to DIRECTV. Morgan was chiding the Golf Channel’s decision to apologize for a tweet in which it asked readers to share their “golf dream.” Olbermann then characterized both the Golf Channel and Morgan as nitwits for trivializing the “I Have A Dream” speech. In this case, it could be very good theater to have Olbermann and Morgan joust on Olbermann. But instead they’ve regularly feuded on Twitter, the same medium that Olbermann’s opening punching bag, The Daily News’ Manish Mehta, used to impulsively call for the firing of the Jets’ head coach. Olbermann could be so much better if its host were ever of a mind to give his targets a chance to respond -- on his show. Or if he’d ever go head-to-head with someone who strongly disagrees with a position he’s taken. Instead, he picks his shots, many of them still cheap, and rolls merrily on his way as television’s self-appointed Great Truth-Teller. In his latest showcase, that continues to be a false premise.